WMCHealth’s Master Chefs of the Hudson Valley: Corks & Forks dinner, held at the Culinary Institute of America in Hyde Park, featured a six-course feast prepared by some of the region’s top chefs. 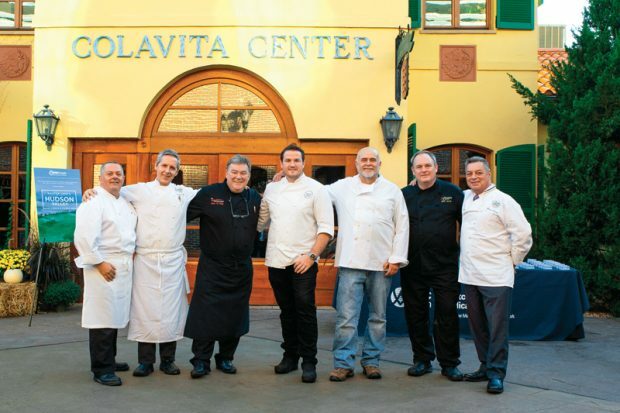 Organized by Chef Peter X. Kelly of Xaviars Restaurant Group, the event’s other master chefs included Jim Ely, Giovanni Scappin, Michael Kelly, Waldy Malouf, Ron Gallo and Charles H. Fells. These chefs also volunteer on WMCHealth’s new Hudson Valley Food for Life Council, which is committed to addressing food policy issues such as food insecurity and access to healthy foods regionally. “We thank these chefs for contributing their time and talents to this important effort,” says Robert S. Ross, Executive Vice President, Northern Region, WMCHealth. Pictured: (From left) Chefs Ron Gallo, Giovanni Scappin, Peter X. Kelly, Michael Kelly, Jim Ely, Charles Fells and Waldy Malouf.